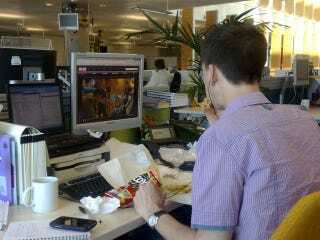 Not Taking A Lunch Break Is Psychologically Bad For You. Here's Why. If you're not taking a lunch break, your creativity is probably suffering. This might seem obvious, but now there's research to back it up. And it doesn't even matter what you eat, or if you eat at all; what's important is that you physically step away from your workspace to recharge. "We know that creativity and innovation happen when people change their environment, and especially when they expose themselves to a natural environment," says Kimberly Elsbach, a professor at the University of California, Davis Graduate School of Management, who studies workplace psychology. "So staying inside, in the same location, is really detrimental to creative thinking. It's also detrimental to doing that rumination that's needed for ideas to percolate and gestate and allow a person to arrive at an 'aha' moment." Elsbach noted that the creativity-enhancing benefits of a "lunch break" can be attained through a variety of means, at any time of day, including just getting up and taking a short walk. She also suggests offices "create community" around breaks, organizing group meals or activities that encourage a short change of scenery during the workday. Gathering up a posse of one's fellow desk jockeys will also help with the inevitable FOMO, since, as Elsbach notes, "there's this demand to be forever available, so people are reluctant to leave their desk in case they miss something." The flip side, she explains, is that not taking a break means you might miss out on that great idea your mind is otherwise too clogged to unleash. Listen to the full Here & Now episode here.